Made in Japan, Asia, 2001. In less than a decade, hybrid cars have secured an important place in motoring history by their offering a much-needed ‘green’ option to conventional petrol-engined motor cars. This aims to partly address increasing community concerns about the polluting effects of the motor car, especially in congested urban areas of the world’s major cities. Featuring a two-door coupé body style accommodating two passengers and finished in pearlescent green paint, this vehicle has been prepared for display with the removal of the metal bonnet and its replacement with one in clear acrylic. This reveals part of the petrol-electric power train used to propel the car. The Insight is powered by a 995cc 3-cylinder 12-valve petrol engine teamed with a slim (60mm) 10kW electric motor that draws current from a nickel metal hydride battery pack when required. The petrol engine produces 56kW at 113Nm at 1500 rpm. Power reaches the front wheels via a 5-speed manual gearbox. The frugal fuel consumption averages 4.5l/100km for combined city and country driving. The aerodynamic body is notable for an extremely low drag coefficient of 0.25Cd. 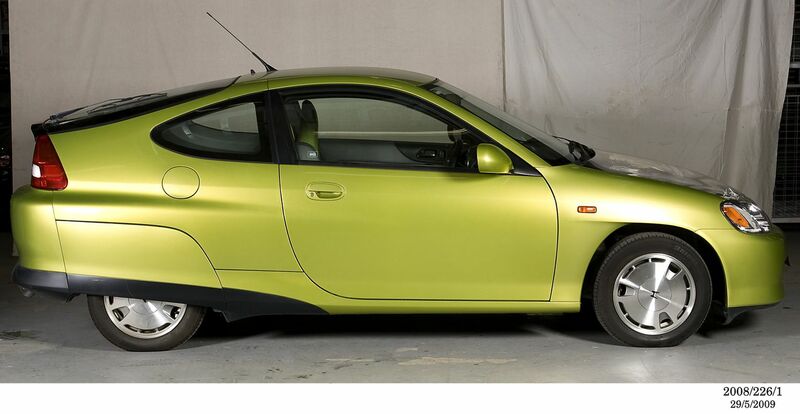 The origins of the Honda Insight lie in the development by Honda in the 1990s of the J-VX concept car. This petrol-electric hybrid car was powered by Honda's 3-cylinder VTEC (Variable Valve Timing and Lift Electronic Control) petrol engine with electrical supply coming from an ultra capacitor. The ultra capacitor (or super capacitor) offers a much more efficient means of storing electricity and providing power than a conventional battery. The body of the J-VX was aerodynamically designed and made of lightweight materials to enhance the car's economy yet also allowed sporty performance. The Honda VV was a pre-production version of the Insight produced in early 1999. While retaining the aerodynamic body form and light weight combined with strength, the electrical power source was changed to a NiMH (nickel-metal hydride) rechargeable battery while the petrol engine was developed for even more efficient operation. The sports car image of the concept car was subdued but it remained a two seater with driving enjoyment a priority. By late 1999, the production version of the Insight had been developed. This was almost identical to the prototype with only cosmetic changes made. To ensure that the Insight was both a technological and market success, Honda set four goals for the Insight: that it be the world's most efficient production car at extremely low emission levels, that it be fun to drive, that it meet consumer expectations in safety and comfort and that it be available at a reasonable price. While the first of these objectives was clearly achieved with the Insight, Honda had only varying degrees of success with the others. Sale of the Insight ceased in Australia in 2004 while its production in Japan ended in 2006 to make way for other Honda models powered by hybrid technology. Since its establishment in 1948, the Honda Motor Company has built a reputation as one of the world's leading makers of cars, motor cycles and engines. Honda has long been known for its innovative approach to automotive engineering and design and took a leading role in the development of hybrid cars during the 1990s. A major driver of the push towards hybrid technology for passenger cars was the rising cost of fuel and the uncertainty of the continued supply of oil from traditional sources in the Middle East. This was first brought into focus with the Arab oil embargo of 1973 which led lawmakers in the United States to draw up legislation to provide incentive for car makers to increase the fuel efficiency of their vehicles. The Corporate Average Fuel Economy (CAFE) regulations, enacted by Congress in 1975, provided economic incentives to manufacturers to maintain a minimum average level of fuel economy across their product ranges, accompanied by graded cost penalties for falling short. Increasing concerns about the negative environmental effects of petrol-engined cars have more recently led many car makers to invest heavily in the development of hybrid power technology. While more exotic forms of powering cars of the future (such as fuel cells powered by pure Hydrogen) are under long term development, hybrid technologies are a shorter term option that can use the existing technology of petrol or diesel engines combined with advanced forms of electrical power storage, charging and regeneration. A hybrid car is one that is powered by two or more forms of fuel. Typically, these are petrol and electricity, in which each plays a mutually supportive role in providing a smooth transition between low and high power requirements of the driver. The Honda Insight is an example of a "series hybrid" in which an electric motor is placed "in series" between a small capacity petrol-powered engine and the car's transmission to supplement the car's power when required. This achieves a more than adequate combined power output with the benefit of extraordinary fuel economy. In a series hybrid, the petrol engine is never solely responsible for powering the vehicle. In general, hybrid vehicles gain operating efficiencies from a range of measures including the use of smaller more efficient engines which periodically shut off when stopped in traffic, the use of lightweight materials and aerodynamic body designs and the application of regenerative braking which employs the electric motor to slow the car while concurrently charging the batteries. By far the most successful hybrid car on the market in recent years has been the Toyota Prius. Since its release in Japan in 1998, the Prius has led the way for Toyota's to establish Toyota as the world's most successful builder of hybrid cars with over 1.5 million sales. The main advantage of the Prius over the Insight was its relative conventionality. The extraordinary economy of the Insight could not be matched by the Prius but the Prius offered much more satisfying performance, better handling, a body design that was easier on the eye and seating capacity for 5 (as opposed to the Insight's 2). Aside from this, the Prius was initially competitively priced to the Insight at about $A45 000, later forcing Honda to considerably reduce the cost of the Insight. The more recently released hybrid version of Honda's Civic model has had relatively more sales success in Australia and the rapidly increasing cost of petrol and diesel fuel is forcing motorists to reconsider their views on the economic benefits of hybrid cars, especially over many years of ownership. Despite their relatively high cost, hybrid cars cost their manufacturers such as Toyota, Honda, Mazda and Ford much more per unit than even their high sale price would suggest. As leaders in the field, Toyota and Honda have understood the market resistance to this new technology and have taken a long term view regarding a return on their massive investment. The first hybrid car produced in Australia was the ECOmmodore, a collaboration between Holden Australia and the CSIRO. This car was a "one-off" experimental vehicle first displayed to the public in May 2000. A petrol-electric hybrid, the ECOommodore was based on Holden's popular Commodore sedan but was not intended to be a prototype for a mass produced version. However, in 2008, both Holden and Toyota Australia announced plans to produce hybrid cars locally as early as 2010. Driven largely by the rising cost of fuel, car manufacturers around the world are turning their attention to the development of hydrid and other alternative powered vehilces as never before. Because it takes about 5 years to produce a new model from concept to showroom floor, it is expected that in the interim the rapidly increasing proportion of sales of small "city cars" will continue to grow. These cars are defined by their conventional petrol powered engines returning relatively good fuel economy for a purchase price of about half that of available hybrid sedans. The most popular examples, all Japanese makes, include the Toyota Yaris, Mazda 2, Suzuki Swift and Honda Jazz all of which offer fuel economy of between 5.5 and 6.5 l/100km. Following hybrid cars into the marketplace in the relatively near future, the most viable form of alternative powered vehicle is the electric powered car. The most significant limitation that has hampered these vehicles since their predecessors took to the road over a century ago is the limited range offered by their batteries. The ponderous weight of the batteries introduced another problem: uninspiring performance. However, recent developments in plug-in electric cars (recharged overnight from mains power) promise to change this situation not only for electric cars but also for hybrids. Toyota plans to introduce its first plug-in hybrid in 2010. Meanwhile, Honda has exciting plans for its FCX car, destined to be the world's first mass-produced fuel cell car. Fuel cells generate electricity from the reaction of hydrogen and oxygen to produce electricity and water. Displayed as a concept car at the world's motor shows in 2007, the FCX will be available in Japan and the United States in 2008 but in very limited numbers. Fuel cell cars have the great advantage of producing zero carbon emissions. Because of this, hydrogen fuel cell cars are considered to be the key to addressing the issues of atmospheric pollution by mass-produced motor vehicles of the future.